When the tyran comes, even our old parents and unborn children are target. 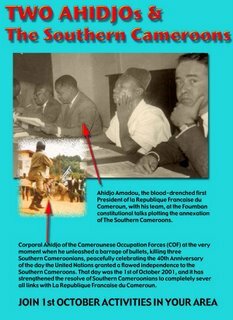 The dragon shall be defeated and The Southern Cameroons shall come to know peace and democracy again. No one shall escape the wrath of justice for even corpses shall be exhumed and asked to render an account of their stewardship or betrayal to a people who had known no peace but injustice, underdevelopment and cronic poverty. We do not hate or discriminate against anyone who speaks the French language, but we hate french. Anyone who hates us because we hate french is also consider an enemy of the Southern Cameroons.